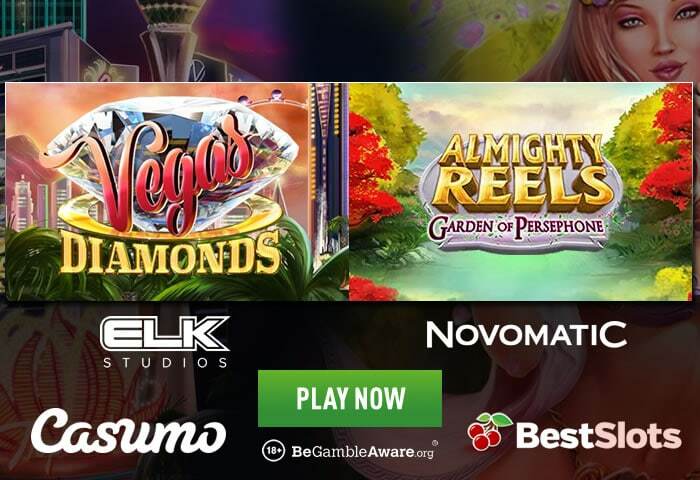 Both ELK Studios and Novomatic have released new slot games – take a walk down the Vegas Strip with Vegas Diamonds and join the beautiful goddess of spring with Almighty Reels – Garden of Persephone. Vegas Diamonds is the latest ELK Studios slot game to be released and comes with 3 reels and 5 paylines. The 3rd game in the 3 reel slot game series, you can spin away from as little as 20p a spin across all compatible devices. Set in Las Vegas, you’ll see classic fruit machine symbols on the reels like watermelons, bars and cherries. The game comes with a Perfect Match Respin feature where the first 2 reels showcasing identical symbols lock in position with 3 respins granted – this allows you to get 3 reels with the same symbols for bigger wins. There’s a Vegas Diamonds Nudge feature where the valuable Vegas Diamond symbol will nudge in place to give you the biggest wins possible. Lastly, there’s the Vegas Diamonds Fortune Wheel feature where you get 3 winning spins on the Fortune Wheel – if you reach the Golden Wheel, you can win up to 1,000 times your stake! You can also gain access to the Free Spins feature where you’ll play with 5 free spins with a 5x multiplier – bonus symbols give you more spins on the Fortune Wheel. For full details, visit the Vegas Diamonds review. Almighty Reels – Garden of Persephone is powered by Novomatic and has 5 reels and 25 paylines. Available to play from just 25p a spin on all devices, this Greek mythology themed game sees you join the queen of the underworld. Visually, it’s very nicely done. The game focuses on the Free Games feature where you receive 10 free spins – you then pick from golden coins to determine which symbol becomes the Giant Symbol. This symbol takes over 3 reels fully (so 9 symbol positions) for enhanced winning potential. For more info, check out the Almighty Reels – Garden of Persephone review. Play them both at Casumo Casino – register now for 20 Starburst free spins as soon as you sign up (no deposit needed). When it comes to making your 1st deposit, you’re received with a generous 100% match bonus up to £300.